L. T. Graham is the author of the murder mystery The Blue Journal. Describe the plot of The Blue Journal in a few sentences. When one of Randi Conway’s psychotherapy patients is found dead of a gunshot wound, the investigation is turned over to Lieutenant Anthony Walker. Formerly a New York City cop, Walker now serves on the police force of an affluent community in Fairfield County, Connecticut. He lives among the privileged gentry, where he understands that appearances are often far removed from reality. This certainly proves to be true in the death of Elizabeth Knoebel, when Walker discovers that she had been keeping a private journal entitled “SEXUAL RITES”. In her diary, Elizabeth was recording the explicit details of her sexual adventures with various men, many of whom were married to the women in her therapy group. Elizabeth was a predator bent on seducing and, in some instances, humiliating these men, obsessed with a perverse mission that Walker believes led to her murder. As Walker uncovers the secrets of Elizabeth’s memoir, he becomes convinced that her killer is another of Randi Conway’s patients. But which one? Dr. Conway is unwilling to divulge her patients’ confidences, complicating the investigation while increasing the danger the therapist faces, especially as Walker comes closer to the truth and to Randi herself. Amidst these unfolding revelations, we meet an assortment of Dr. Conway’s patients, glimpsing the dynamics that cause marriages to succeed, to fail and, sometimes, to end in tragedy. Anyone who loves a good mystery, or who is interested in what makes a marriage succeed or fail, or who wants to explore what drives sexual attitudes and desires. What inspired you to write a murder mystery involving a detective who is out of his element, having moved from NYC to a suburb in Connecticut? Some years ago, I witnessed the marriages of several close friends dissolve into unhappiness, unpleasantness and, ultimately, divorce. I wondered what led to the disintegration of those relationships, and why people I knew so well, and thought were so happy, had grown apart. That was my original inspiration for creating and examining the various characters for this book. The murder victim, Elizabeth, is unique in that she had a specific sexual agenda and carefully documented her sexual adventures. What inspirations contributed to this character? Every good book has a good villain. Elizabeth is based on a particularly evil woman, and I chose her to be the central figure of the mystery around which the story revolves. I love them all, the good and the bad. A novelist spends so much time with his characters, you cannot avoid getting close to them. My favorite, however, was Anthony Walker. I like all of his contradictions, flaws , and his basic humanity. 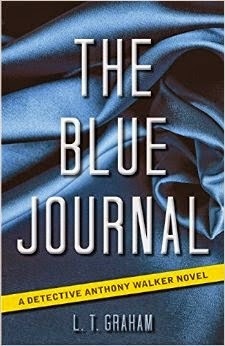 The Blue Journal, in addition to being a mystery, contains elements of suspense and erotica. Did you want these elements in the story since the beginning of the writing process or was incorporating these elements just something that happened as you wrote? These elements were always a part of the story, since they are inextricably intertwined with the action, the characters, and the things I wanted to examine as I wrote—and the things I want readers to experience and relate to as they read the novel. Were there any murder mysteries that influenced your style as you developed as a writer? I cannot possibly point to any one book or author, since the genre is so rich with talent. From Poe to Christie to P. D. James, just too many to name. Can you share with us what the creative writing process is like for you, from initial idea to finished novel? Only if you have a year! Seriously, the ideas for my novels percolate for quite a while until I even decide I am willing to spend the time and effort necessary to develop a particular concept. Then I move from summary, to outline, to first draft and then rewrite after rewrite after rewrite. As to process, I prefer to write early in the morning so, if I can put in a good three or four hours, I know I’ll be happy the rest of the day. How do you feel about the increasing popularity of ebooks? Anything that gets people to read is a good thing, and the devices certainly make traveling with multiple books a lot easier. Personally, I like the feel of holding a book, but that’s just me. Can you tell us anything about the next book in the Detective Anthony Walker series? Well, both Walker and Randi Conway will be back. And this time, the murders at the center of the book will be particularly sinister. Caldric Blackwell is the author of the easy read fantasy novel The Missing Alchemist. Describe your new middle grade novel, The Missing Alchemist. 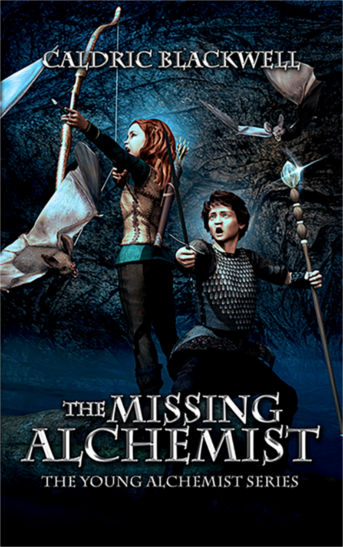 The Missing Alchemist, book 1 in the Young Alchemist series, follows the story of fourteen-year-old Craig Pike. Having grown up in an orphanage, Craig appreciates his comfortable life as a student of Cornelius, a famous alchemist. But when Cornelius is kidnapped, Craig leaves comfort behind to search for him. How was the experience of writing a middle grade novel different from writing your last book, The Boy Who Couldn't Cry Wolf or your early chapter book, The Enchanted River Race? Good question! It was the same in that it started with a very simple idea and grew from there. In The Boy Who Couldn’t Cry Wolf, I started with the idea of a young werewolf who has to solve a problem. In The Missing Alchemist, I started with a young alchemist who must rescue his teacher. Writing The Missing Alchemist differed from writing a picture book in that the development of the story was a lot more complex – more characters, more events, etc. Additionally, there was a fair amount of world-building in The Missing Alchemist. The main characters, Craig and Audrey, travel to a number of different areas throughout the novel, so I had to create environments, histories, etc for each region. I also had to think about the grand trajectory of the plot since the book is part of a series. The Missing Alchemist is very different from your other books because it’s aimed at an older audience. What made you decide to write a middle grade novel? While working out the basics of the story, it became clear to me that The Missing Alchemist would be best as a middle grade novel. The story was simply too complicated to be an early chapter book. At the same time, it was too simple to be a young adult novel, so it became a middle grade novel. I didn't start out thinking, "I want to write a middle grade novel." I might try that approach in the future, though! What made you decide to write an alchemist book? I was fascinated when I first learned about medieval alchemists in history class when I was in elementary school. It was so interesting I had to re-visit it all these years later with my writing. I had fun writing all the characters. I think I had the most interesting time writing Bert, a blacksmith. It was a unique experience writing him because he starts out as a minor character yet influences the direction of the plot in a major way. I can’t say anything more without giving something away, but keep an eye out for him while reading the book! Did you read any middle grade novels growing up? Yes! I really liked Lemony Snicket’s The Series of Unfortunate Events. I love that they have this dark, gothic vibe yet at the same time are light-spirited and whimsical. Yes! Music is a huge part of my life and is an integral part of my creative process. Sometimes, if the ideas aren't coming quickly enough, I'll take a break and play guitar or piano. Music and writing go hand-in-hand for me. I’m currently working on the next book in the Young Alchemist series. I’m really excited about it because there are a couple revelations in The Missing Alchemist that are left somewhat open-ended for the sequel. The readers will also get to see more of the world. There are some really interesting places I think readers will enjoy! Anything else you want to tell potential readers? Anyone interested in learning more about The Missing Alchemist or any of my other books can find more information at www.caldricblackwell.com.